Happy New Year. It looks like I'll be blogging everyday for a third year. Ugh. I'm getting burned out doing this but if I don't then a lot of good memories will be forgotten. Heck, I can't even remember last week. We'll see how it goes. Maybe it will just be a picture on some days. Maybe there won't be a picture but a paragraph. Who knows. Now on to the post. 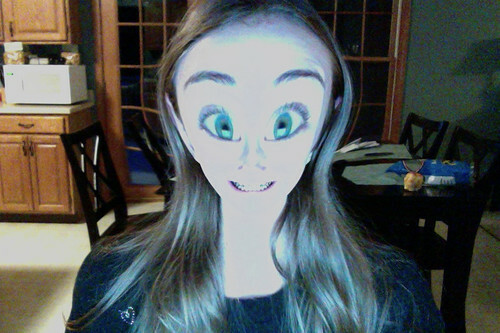 The kidlings have been having a lot of fun using Photo booth on the iMac. The other day Kade monopolized the computer playing around. Then it was Mattey's turn the next day. Today Meg hogged the iMac. I must admit she came up with some fun pictures. I'll sharing my favorite. I need an i-something so I can have photo booth. That looks AWESOME.